• Enjoy the rain...from indoors. Do as little as possible in the garden during a downpour. Working in wet soil causes compaction. 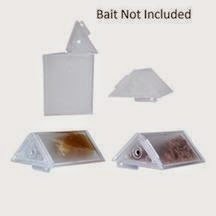 • Add gutter extensions to move water away from the house. 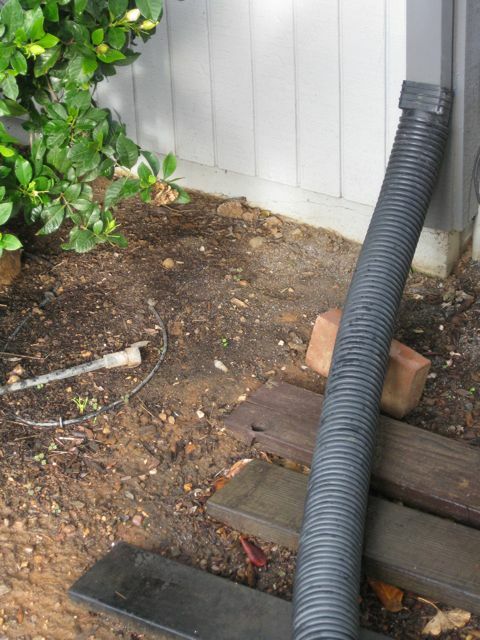 These sections of flexible pipe allow you to divert water several feet away from plants that don't like wet feet. And, it may keep your house foundation drier, too. A better system for draining water away from house gutters or garden beds that habitually have slow water percolation: a hard pipe drain system. Surface drains lead to three-inch PVC pipe, buried beneath the soil and sloping down towards the lowest part of the property or to an outlet. Be sure to slope the drain pipe, allowing at least a one foot drop for each 100 feet of length (one quarter-inch per foot). Dig backwards from where the water will exit the pipe, trenching back towards the source of flooding to help determine how deep to lay the drain pipe. Line the trench with a few inches of gravel, both above and below the pipe. For a lawn area, try to lay the pipe at least two feet below the surface. 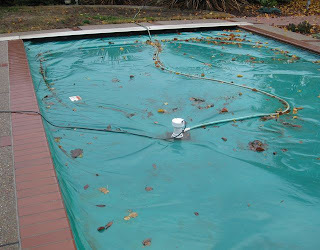 • Get a submersible sump pump to move water in a hurry from pool covers and planted areas that flood. Some models are water activated (they automatically come on when the water level rises an inch or so). 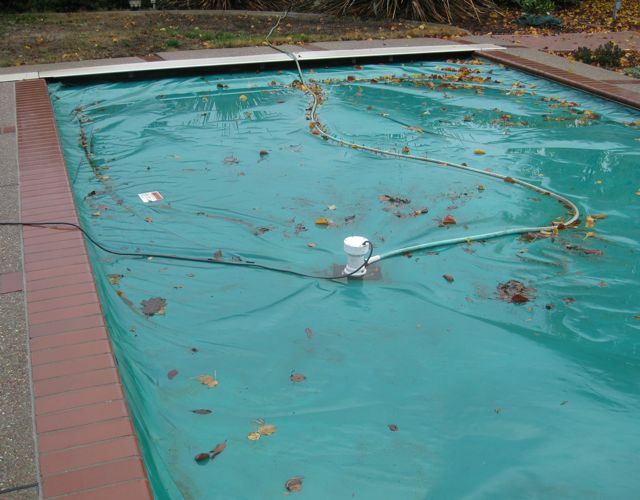 Place the sump pump on a board to keep dirt from clogging the filtration screen. • Dig a hole. 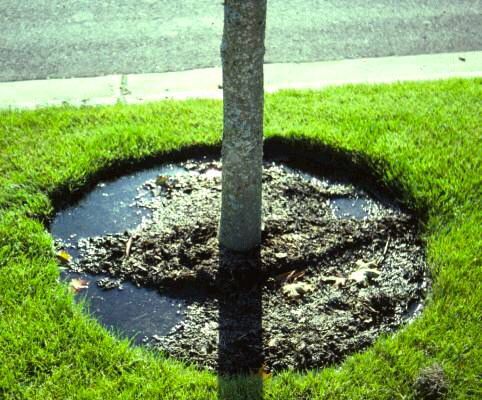 A hole (also called a sump) that is dug in the lowest portion of your yard, a hole that penetrates through all the layers of hardpan (usually 2-4 feet below the surface), can help drain away storm water. Line the hole with a non-porous material (hard plastic sheeting, for example) to keep the surrounding dirt from falling back into the hole. Fill the hole with small rocks, about one inch in diameter. • Construct an underground hard drain or a French drain (perforated drain pipe or gravel creek bed). If it's the lawn area that's flooding, dig a trench and lay a drain line in the lowest area of the lawn. Don't do any digging immediately after a heavy rain, though; wait until the soil dries enough to avoid unnecessary soil compaction. Be sure to slope the perforated drain pipe, allowing at least a one foot drop for each 100 feet of length (one quarter-inch per foot). Dig backwards from where the water will exit the pipe, trenching back towards the source of flooding to help determine how deep to lay the drain pipe. Line the trench with a few inches of gravel, both above and below the pipe. For a lawn area, try to lay the pipe at least two feet below the surface. 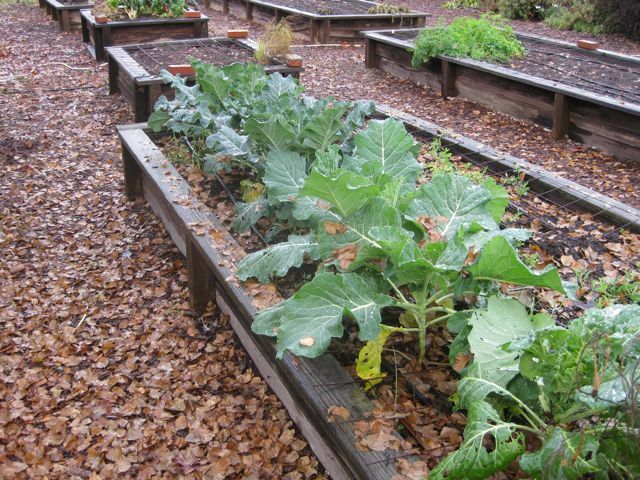 • If it's the garden bed that's flooding, consider building raised beds this fall, lining the bed with 2X8, 2X10 or 2X12 redwood planks. Capping off the top of these boards with 2X6 redwood will give you a comfortable place to sit while harvesting vegetables and pulling weeds. • If you haven't planted in a flooded area yet, consider creating mounds first, planting trees and shrubs on the top of the mounds. If you're still stuck with pools of standing water after heavy rains despite your best efforts, consider planting trees and shrubs that can take "wet feet". Water-tolerant trees for many areas of Northern and Central California include sweet gum, magnolia, and tupelo. 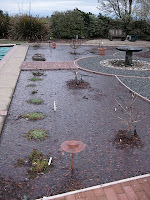 Shrubs for wet areas include thuja and red twig dogwood. 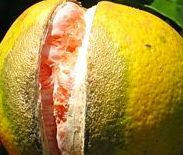 Washington Navel and other varieties of citrus are beginning to ripen in our area, and many backyard gardeners are horrified at what they are seeing currently, wondering if Mother Nature is pulling some sort of Halloween prank. You may be facing the same conundrum with your own backyard citrus. The short answer: splitting oranges are usually due to stress to the tree, usually a combination of fluctuating temperatures, humidity, soil moisture and possibly fertilizer levels. Oh, and an on-going drought. 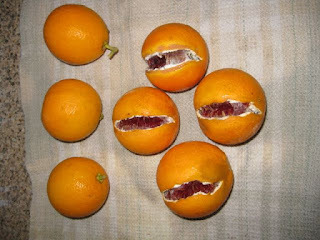 The long answer, from Pam Geisel, a UC Cooperative Extension Farm Advisor, who has studied the problem of citrus split: When hot weather is combined with high winds, navel orange trees become drought stressed and begin to take water from the young fruit, causing the fruit to soften and the leaves to cup. If the tree is then irrigated heavily, the dehydrated fruit swell, causing them to crack. 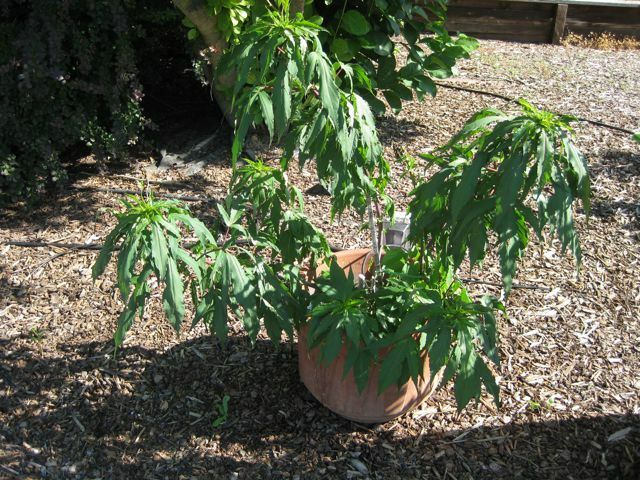 Young trees or dwarf varieties with relatively small or shallow root systems, as well as trees grown in very sandy or porous soils that do not retain moisture well may be more susceptible to fruit splitting. Backyard gardeners can help minimize fruit split in navel oranges by paying attention to the summertime weather forecasts. When hot winds are predicted, irrigate before the winds begin. 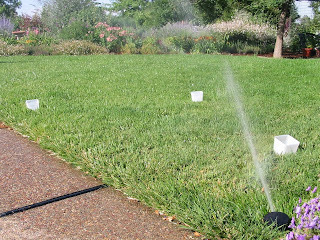 After the hot winds subside, irrigate lightly for a few days and then resume a normal irrigation schedule. Adding four inches of an organic mulch to the surface beneath the tree can also moderate soil moisture loss, as well as feeding the soil and controlling weeds. Geisel also advises: "Instead of a single large application of quick release fertilizer each year, smaller monthly applications throughout the growing season (Feb. through May) may help keep nutrient levels constant." 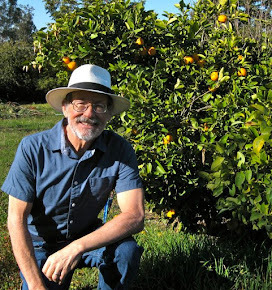 Citrus grower Lance Walheim, author of the book, "Citrus ", says that a good watering pattern for oranges includes adjusting it to the weather. Allow the top three or four inches to dry before irrigating deeply. He explains that too much water retards the spread of roots and promotes soil-borne diseases. An orange tree that gets too little water will grow poorly and may die. Keep an eye out for the signs of moisture stress on the orange trees: wilting or off-colored foliage. Ask a dozen citrus growers how they fertilize, and you may get 12 different answers. The University of California has several recommendations: "Apply one application of nitrogen (ammonium nitrate, ammonium sulfate, or urea) in late December to February. 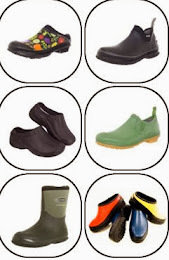 Alternatively, fertilizers can be applied in several applications. Many commercial growers apply 1/3 of the total nitrogen needed in February, July, and September. Using a balanced citrus food may help to correct mineral deficiencies as well as provide a more complete nutrition. Manure should be applied in the fall so that the winter rains can leach the salts. Steer and chicken manure should be used sparingly because they are high in salt and may burn the trees. 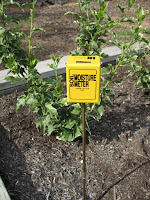 Mature citrus trees use 1-1.5 lb. of actual nitrogen (N) per tree per year." 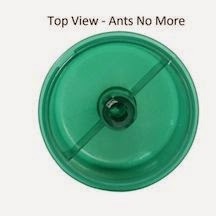 I'm no fan of quick release, ammonia-based products; it's too easy to apply too much, and could damage your tree. Others have weighed in on why these salt-containing formulations are bad for your garden. But for those of you that can't resist those $3 bags of Sulfate of Ammonia piled up outside the drug store, remember that Sulfate of Ammonia (20-0-0) consists of 20% actual nitrogen. So, applying one pound of actual nitrogen over three feedings per year per mature citrus tree equals about a pound and a half of ammonium sulfate per application, spread evenly beneath the outer dripline of the tree, following the label directions. My citrus feeding regimen for my containerized (half-barrels) citrus trees is organic, applied every other week during the growing season (February through September): a combination of water soluble fish emulsion and sea kelp. 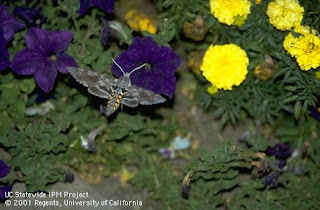 Fertilizer leaches through containerized plants more quickly than in-ground plants. So, a light feeding, but more often (every other week instead of monthly), mitigates that loss. 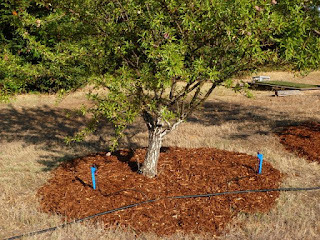 There are plenty of complete and balanced organic fertilizers available for fruit trees, some that only need to be applied a few times a year. Timed-release synthetic fertilizers offer the convenience of supplying nutrients at an even rate, but are usually more expensive. 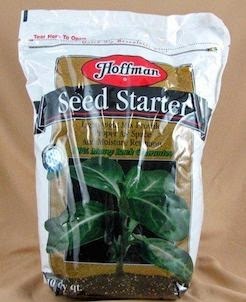 Whichever fertilizer you choose, apply it according to the label directions. Lance Walheim also advises against fertilizing oranges after the end of summer. 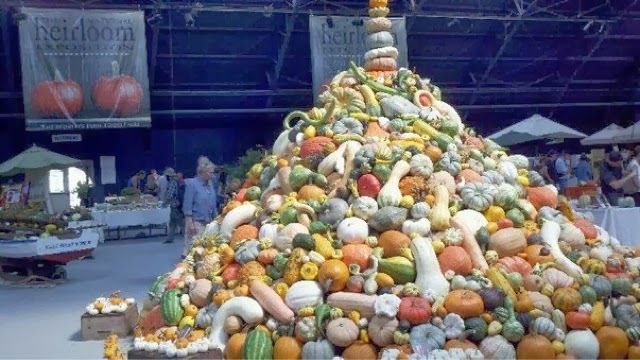 Late applications of fertilizer to deficient trees, he says, can lower fruit quality, make the rind tougher and exposes new growth to the ill effects of a winter freeze. There are no pests or diseases that cause splitting, nor is there a chemical control for it, explains Pam Geisel. It is a problem that stems from environmental or cultural conditions. Blame the weather this year. Next year, mulch, water and fertilize that navel orange tree correctly to help minimize the fruit split. Droopy Leaves on a Hot Afternoon. Water...Or Not? Do your plants have droopy leaves on a hot afternoon? There are two schools of thought. One school says plants conserve moisture on a hot afternoon by allowing their leaves to sag. The other school says: "Don't believe that first school." Drooping leaves are usually indicative of a lack of water from the root zone. "Large, thin leaves, common in many of ornamental, annual and vegetable species, do not conserve water," writes Washington State University Horticulture Professor Linda Chalker-Scott. "Tomatoes, zucchini and black-eyed Susans...are not water conservers. 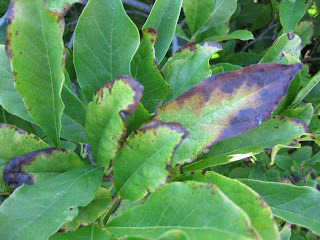 Chronic wilting of these and others can eventually cause leaf tip and margin necrosis (or tissue death). 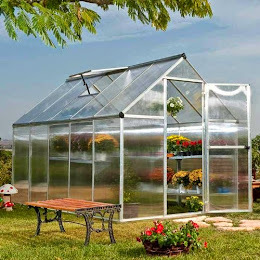 It also reduces growth, so that your yield of tomatoes, zucchini and black-eyed Susans will be decreased." She advises applying a layer of mulch around those plants to help conserve water. Also, check the moisture at the root level before watering. • A day or two after watering, dig down 8 to 10 inches with a trowel or small shovel, near the drip line (outer canopy) of the plant. Doing this in two or three spots would be more helpful. • At that depth, grab a handful of the soil. Squeeze that handful. If it is muddy and watery, reduce your watering for plants that require regular (but not frequent) irrigation. If it is so dry you cannot form a clod in your hand (it turns to dust instead), increase your watering (for those plants that require moderate amounts of water). • If you can form a dirt clod in your hand, yet break it apart with a little effort, that is probably the correct soil moisture for your plant. • Steve Zien, owner of the Citrus Heights-based organic landscaping consulting service, Living Resources, recommends the use of a soil sampling tube to determine the moisture at root level. 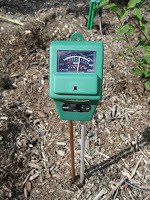 "Just press the tube down six to eight inches into the soil after you are done watering," says Zien. "When you bring it back up, the open slot along the side of the tube will let you see if the soil at that depth is wet, moist or dry. Adjust your watering time so that the soil sample is moist, not too wet or dry." 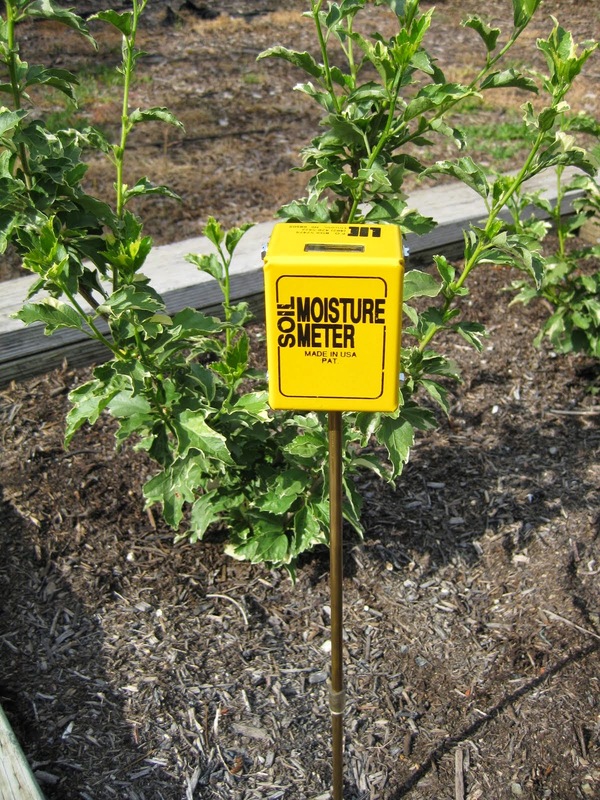 • An easier, but more unreliable way to measure the water content of the soil: purchase an inexpensive (under $10) moisture meter, available at most nurseries . Test its accuracy by putting its probe into a glass of water. If the probe does not read "wet", choose another. Expect it to function for only a year or so. 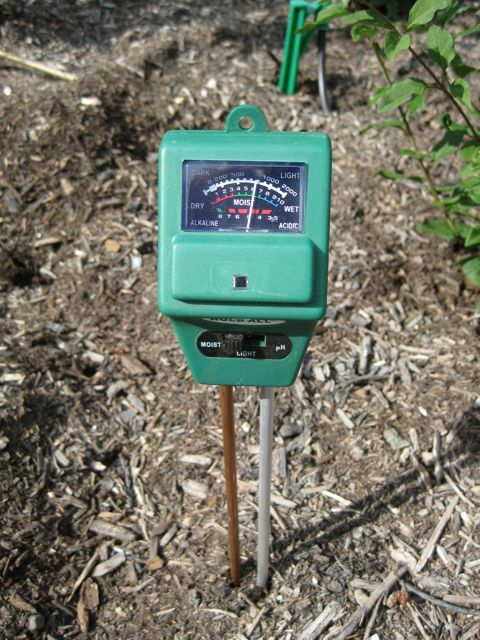 • Battery operated moisture meter probes may set you back a few more dollars, but in my experience - with proper care (clean them after each use, don't leave them outdoors) - they will last many years. • Extended, infrequent, slowly applied irrigation is the most efficient watering method. 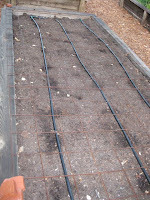 Soaker dripline or drip irrigation systems work best. Here in the Central Valley, foothills and Bay Area, run them for 3 to 6 hours at a time, twice a week, in the summer. This is only a guideline to get you started. Adjust that timing to your particular soil type and plants. • And, don't forget: add more drip emitters and drip lines as the plant grows, especially for trees and shrubs. Make sure to get water to the outer canopy of the plant (and beyond) where the roots travel. 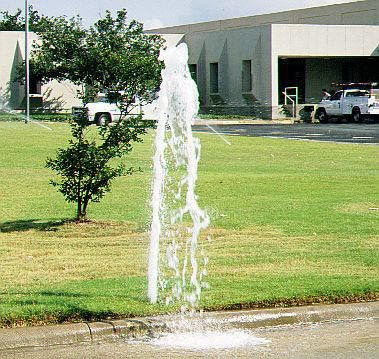 Improper watering is the number one cause of plant failure. Knowing how wet the soil is at the root level can help you keep your plants healthy. Keep in mind: different plants have different watering needs. Learn those needs, then group plants together with similar watering requirements when designing your landscape. The Sunset Western Garden Book is a good source for that information. Wilted leaves in the morning. Wilted leaves in the afternoon. Wilted leaves in the evening. Premature fall color of leaves. The soil has a foul smell, like rotten eggs. Soil is a blue-gray color. Yellowing, wilting and/or dropping of leaves. Small, corky outgrowths on the undersides of leaves. Be warned, though: sometimes, symptoms of overwatering and underwatering can be the same (such as leaf wilting). 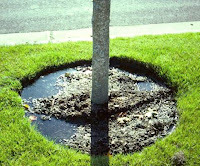 And, symptoms of soil water problems may actually be another problem...that was caused by your watering regimen! Root rots, for example, thrive in saturated soils. Frequent, light watering leads to shallow rooting, increasing the chances of plant problems. How much water does your lawn need? • Avoid planting turf species that require frequent watering, such as bluegrass or ryegrass. 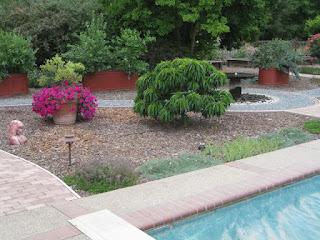 • Design your landscape to minimize water runoff onto hard surfaces and into storm drains. • To reduce runoff, install non-irrigated buffer areas, which include water-efficient plants or permeable features, next to sidewalks or on slopes. 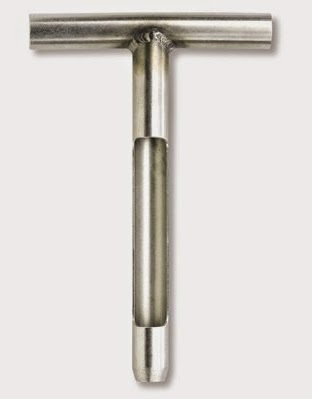 • Aerate heavy or compacted soils, so water can easily move down to reach grass roots. • Install an irrigation system that you can adjust to properly water areas of your landscape that have different requirements. • Water only when your lawn needs it. • Water requirements vary according to turf species, location, and month of the year. • Most lawns need water when the top 2 inches of soil have dried out. 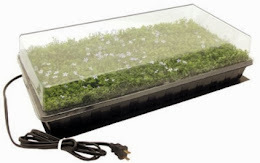 • Shady and sunny areas and different soil types will have different water requirements. 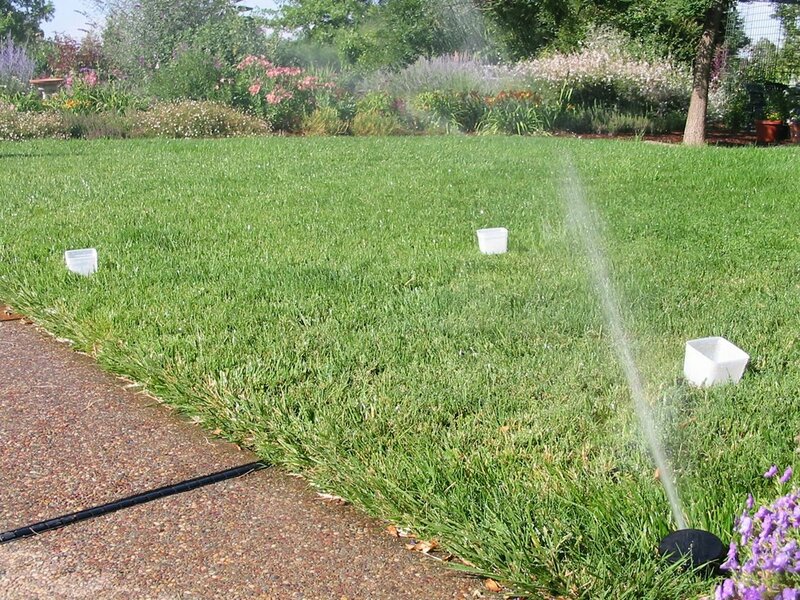 • Deeper, less frequent watering is best for most lawns. Water only 2 to 3 times a week. • Make sure your sprinkler system isn’t producing runoff, especially on slopes. 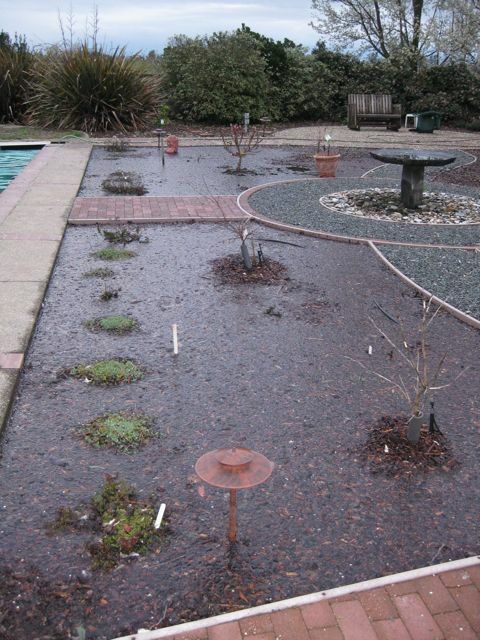 If you see runoff, use shorter watering times and repeat the cycle to allow time for the water to move into the soil. • Water early in the morning when evaporation and wind are minimal. 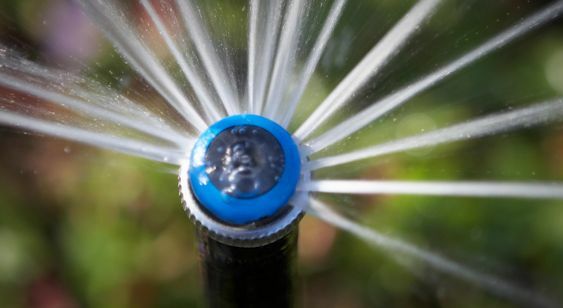 • Adjust your watering schedule seasonally, and shut off your irrigation system during rainy weather. "As a first time tomato grower, I have two plants in pots (Patio & Bush Better Boy), and four in the ground (Roma, Sun Gold, Lemon Boy, & Black Krim). Something was eating the young tomatoes in the pots. Upon closer inspection I found three juicy, green caterpillars around the plants. 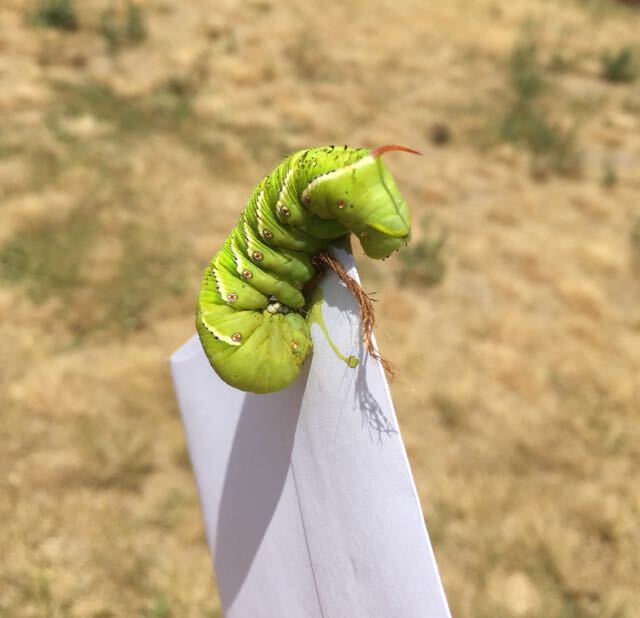 I did some research and they seem to be tomato hornworm (Manduca quinquemaculata) - a common pest and best controlled by hand picking and dumping in soapy water, or allowing the beneficial wasps to do the job. Any other suggestions controlling these tomato eaters?" Doug, one option might be to stick that critter in the envelope that he’s resting on, and mail it to someone you don’t like. However, the envelope may require extra postage. This time of year, many backyard gardeners, in addition to Doug, are glaring at their partially eaten tomato plants, and muttering under their breath, "Just where do these blankety-blank tomato worms come from?" 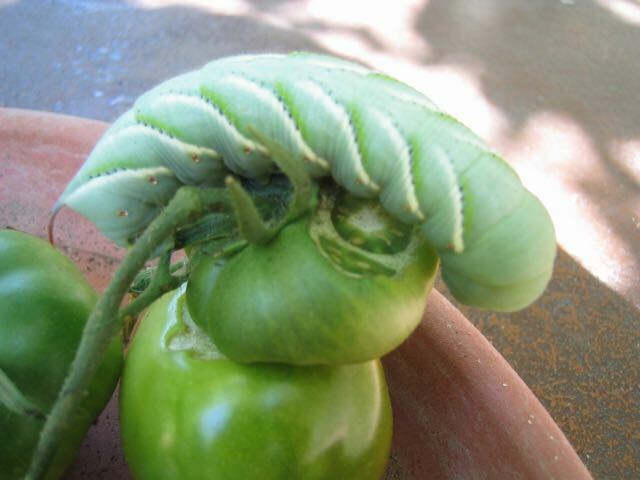 Contrary to a popular urban legend, the larvae of the tomato hornworm do not lurk inside tomato seeds, a diabolical plot between seed growers and chemical manufacturers to increase profits. Nor are the worms drawn by the scent of your tomato plants from deep within your garden soil, emerging forth to wreak havoc. 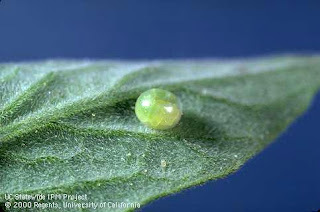 The tomato and tobacco hornworm begin their life cycle as a small, singular, light green egg, about the size of a thick pinhead, laid in late spring and early summer on the underside of a tomato leaf. That egg got there courtesy of a flying culprit, the sphinx moth. 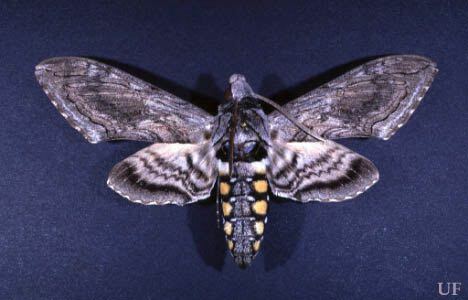 Both the tomato hornworm sphinx moth and the tobacco hornworm sphinx moth have similar features: about a four-inch-wide wingspan, gray body, brown wing streaks as well as yellow and white body markings. The egg laid by the sphinx moth hatches within a week, and the emerging hornworm (technically, a caterpillar) begins eating. And eating. And growing. 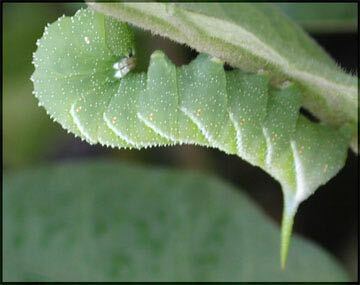 A full-grown hornworm, satiated by its tomato plant diet (supplemented with whatever else is handy, including potatoes, eggplants and peppers) can get up to four inches long. 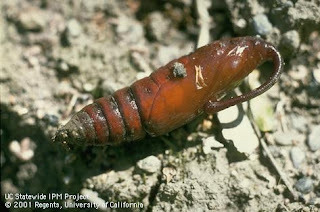 Disking or rototilling after harvest destroys their pupae in the soil and prevents the adult moths from developing and emerging from the soil the following spring. Again. Hand snipping the tomato worms with scissors or pruners can be a satisfying evening chore. 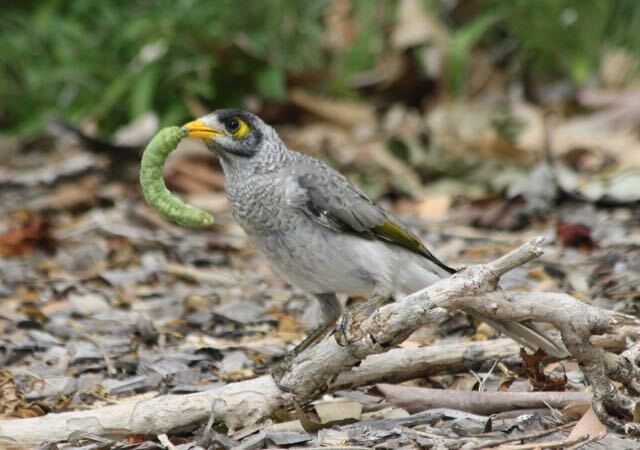 The trick, as seasoned gardeners know, is trying to find the hornworms in the first place. Tracing their black, pellet-shaped excrement from the ground back up the plant usually yields successful results. The best time to find them is in the cool of the morning or evening. Another popular tomato worm hangout: the tender, new growth at the top and sides of tomato plants. If you prefer to douse tomato hornworms in chemicals, use one registered for use on this pest. Soaps and oils might slow them down but won’t kill them. What does work are stomach poisons that contain a bacterial insecticide, such Bacillus thuringiensis (Bt) or spinosad. 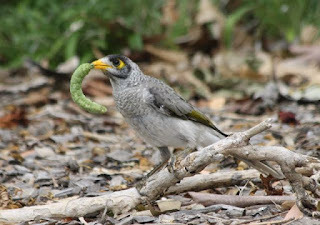 They can be applied directly to the offending hornworms. However, this works best while the worms are still small. The bigger ones are more problematic, but there may be help already at work in your yard. Besides birds, the tomato experts at UC Davis point out that there are a lot of garden good guys that can help you battle the hornworms. 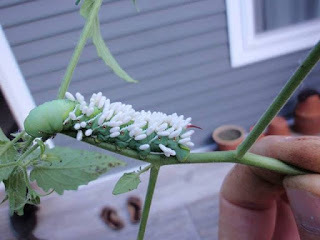 The UCD Integrated Pest Management website says: “Natural enemies normally keep tomato hornworm populations under control. Hornworm eggs are attacked by Trichogramma parasites (a small wasp); another small wasp, Hyposoter exiguae, attacks the larvae." Hornworm parasitized by Trichogramma wasps. Let it be. There are also several general predators to keep populations under control, including green lacewings, damsel bugs, assassin bugs, big-eyed bugs, minute pirate bugs, soldier beetles, ground beetles, and spiders.